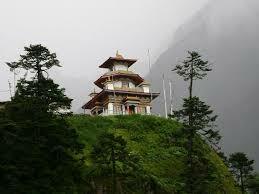 Here is Some Information about Taktsang Monastery in Tawang Arunachal Pradesh india. The Taktsang Monastery is located at 50 km from Tawang town,near the Sangetsar Lake Arunachal Pradesh.The temple was built in 8th century and built by Guru Padmasambhava. Surrounded by forests with coniferous trees and mountains, the Taktsang Monastery is perched on a hill, making it a perfect location for meditation. Established as a part of Buddhist culture in India, the monastery is well known to have been present since the 8th century CE, when anecdotes of Guru Padmasambhava are well accounted for. 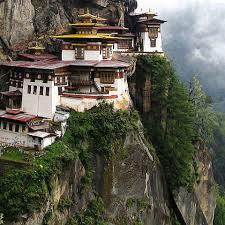 Another name for this monastery is Taktsang Palphug Monastery, which also means Tiger’s Nest or Tiger’s Den. Building of the monastery has been done in such a way that the rocks and terrain have been used to provide support and strength. The monastery is said to be perched quite precariously on these rocks. Rock cave, where the guru is said to have performed his meditation is considered to be the largest in the region and has plenty of Buddha pictures and sculptures. Also, here a scripture can be found, which has importance for the followers of the monastery’s principles. All the buildings constructed in the area have interconnecting stairways and steps. A large Buddha idol is found in the temple, which is situated at the highest point. Balconies are a common feature in all the buildings, which are perched towards the valleys, providing a picturesque view of the mountains and valleys. There are other important structures present within the Taktsang monastery such as Taktsang Zandgo Pari, the building which was occupied by the wife of Guru Rinpoche, Urgyan Tsemo or the Peak of Urgyan, the prayer wheel and the holy cave temple, which is the primary shrine of the monastery. A lot of paintings showing the historical anecdotes of Guru Rinpoche are found, along with various structures representing Buddhism. Background history of the Taktsang monastery is related to its establishment by Guru Padmasambhava or Rinpoche, who is supposed to have arrived at this location from Tibet. There was a demon at this place, after whose killing, the guru performed meditation of the cave for about 3 years, and some months. 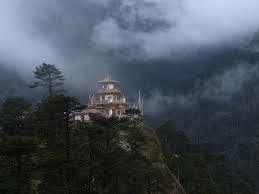 He emerged after the meditation of 8 forms and since then, the place has become holy and is known as Tiger's Nest. The monastery complex was built around the cave by Tenzin Rabgye, who according to some people was the reincarnation of Guru Rinpoche. He was instrumental of establishing Buddhism of the region of Bhutan and the Nyingmapa school. Due to the historical anecdotes, many Buddhist saints have come to the cave site for meditation and gradually, it became established as a well known place for meditation and worship by Buddhist followers. The traditional dance form of Tsechu had a strong following during these historical days also. Tsechu festival is held in the month of March – April, in honour of Guru Padmasambhava and is believed to have been started during the 17th century. During the rule of Bhutan by Shabdrung, Terton Pema Lingpa of Bhumthang, various religious dance forms and religious festivals started to be organised at the site of Taktsang Monastery in Paro hills. When Bhutan was attacked by Tibetan ruler in 17th century, Pema Lingpa conducted various rituals and dances to invoke the guru Rinpoche and seek his blessings in the fight with Tibet and also went on to win the fight, but failed to establish a monastery as promised. But, his successor, Tenzin Rabgye constructed the monastery in the latter part of 17th century and regularly conducted the Tsechu festival every year, with maintaining of the traditional Black hat dance forms. 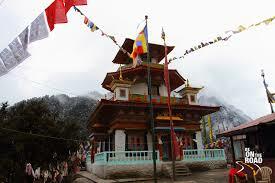 By Road : There are public and private vehedcals available to reach Taktsang Monastery Arunachal Pradesh. By Rail : The Nearest Railway station is Tezpur station. By Air : the Nearest Airport is tezpur Airport.